Description: Tufted perennial, with short rhizome. Culms trigonous to terete, smooth, 35–100 cm high, 1.3–2.7 mm diam. 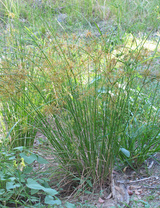 Leaves mostly shorter than culms, often septate-nodulose, 2–6 mm wide. 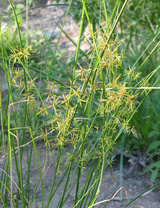 Inflorescence compound, with 4–7 primary branches to 10 cm long; clusters loose, spicate to subdigitate, hemispherical, 25–65 mm diam. ; involucral bracts leaf-like, 2 or 3 much exceeding inflorescence. 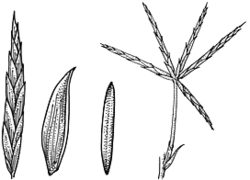 Spikelets flattened, 4–9 per cluster, 8–43 mm long, 1.2–2 mm wide in side view, 10–45-flowered; rachilla broadly winged; glume spacing 1.6–2.3 mm; spikelet falling as unit, or rachilla persistent. Glumes retuse to obtuse with mucro to 0.2 mm long, with sides 2- or 3-nerved, 2.5–3.4 mm long, yellow to dark golden brown. Stamens 3. Style 3-fid. Nut trigonous, very narrow-ellipsoid, about as long as glume, 1.9–2.2 mm long, c. 0.4 mm diam., pale yellow-brown. Distribution and occurrence: Grows in seasonally wet situations, such as stream banks and roadside drains; south to the Pilliga Scrub. Also in Qld.